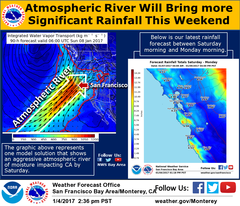 The National Weather Service, Bay Area is warning that a significant storm is headed our way. Light rain is expected to begin Saturday then become heavy Saturday evening lasting through Sunday. Heavy rainfall may overwhelm waterways and roadway drainage systems, leading to flooding. High winds from 15-30 mph are also expected, with gusts up to 40 mph, which may lead to downed trees and power lines. If you have flood-prone areas around your home, consider stocking up on sandbags now. A complimentary Sandbag Station is available to Los Altos residents at the City’s Maintenance Service Center located at 707 Fremont Avenue in Los Altos. Secure outdoor items that can be blown about by strong wind. Stock up on food and water in order to avoid unnecessary driving during heavy rain and wind. Turn Around, Don't Drown® - Avoid walking or driving through flood waters; just 6 inches of moving water can knock you down and 2 feet of water can sweep your vehicle away. If you receive a flash flood alert, move immediately to higher ground. Flash floods are the #1 cause of weather-related deaths in the US. In the event of an emergency, call us by dialing 9-1-1. For non-emergency calls, dial (650) 947-2770.